The 2017 Formula DRIFT pro championship is decided. Oh, we know there’s still one round left on the calendar, and Fredric Aasbo – 2015 champ and driver of the Rockstar Energy Corolla iM – is mathematically still breathing, even though at this point he’s a distant 96 points behind leader James Deane in the Worthouse Drift Team S15, and not very likely to catch him. It’s that last part we can’t reconcile, and anyone who wants to believe there’s still a chance for Deane to falter and Aasbo to somehow make a miracle happen – well, we hate to break it to you, but there’s no denying fate. It looked a tad bit more possible going into Round 7 of 8, set on a section of the infield road course at Texas Motor Speedway; then, Deane was only 57 markers out of reach, and with a lucky break (heck, Aasbo even had a chance to eliminate Deane!) this story might be different. But as he has in the last two rounds—Montreal and Seattle—Deane qualified number one, and again looked unbeatable. 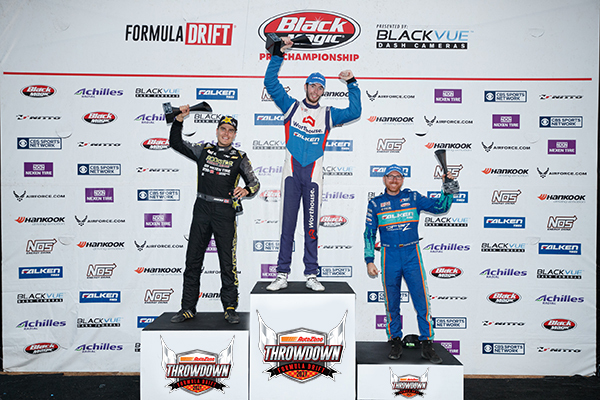 Long Beach, Calif. – August 5, 2017 – Formula DRIFT Black Magic Pro Championship presented by BlackVue Dash Cameras returned to Evergreen Speedway for the Round 6: Autozone Throwdown. Points leader James Deane once again finishes on top of the podium to increase his lead in the Pro Championship standings. Round 6: Autozone Throwdown was a highly competitive event that sets up a two-way battle for the championship between Deane and former Formula DRIFT champion, Fredric Aasbo with only two events remaining in the season. The capacity crowd was kept entertained throughout the event weekend, while the Livestream drew over 1 million views over the course of the weekend. “Year in and year out the fans in the Pacific Northwest have proven to be some of the most diehard drifting fans out there,” said Jim Liaw, President of Formula DRIFT. 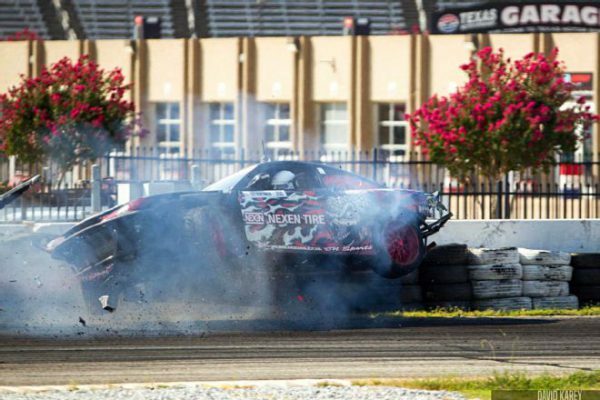 “This event truly showcased what drifting is all about with the drivers putting on one amazing show for the fans. In the Top 4, number one qualifier and current points leader, James Deane in the Worthouse Drift Team / Falken Tire Nissan 240 faced off against former champion Dai Yoshihara in the Falken Tire / Turn 14 Distribution Subaru BRZ. It was a hard fought battle, but Deane was able to take advantage of an error by Yoshihara to move into the Finals. On the other side of the Top 4 bracket, former champion Fredric Aasbo in the Rockstar Energy / Nexen Tire Toyota Corolla iM faced Aurimas “Odi” Bakchis in the Falken Tires / Drifz Wheels / ARK Performance Nissan 240SX. Aasbo edged out his opponent to face the current points leader in a battle that could effect the rest of the season. Both drivers put it all on the line with the first battle too close to call forcing the judges to call a One More Time. The final battle was also very close, but after deliberation Deane was able to earn the victory to increase his points lead on Aasbo with only two events remaining. The action continues to Round 7: Showdown at Texas Motor Speedway on September 8-9. For more information visit, www.formulad.com and find Formula DRIFT on Instagram @formulad, Facebook www.facebook.com/formuladrift, Twitter @FormulaDrift, and Snapchat – formula_drift. Tune into Formula DRIFT on CBS Sports and check your local listings for airtimes.